Haven’t seen anything cute in a while? 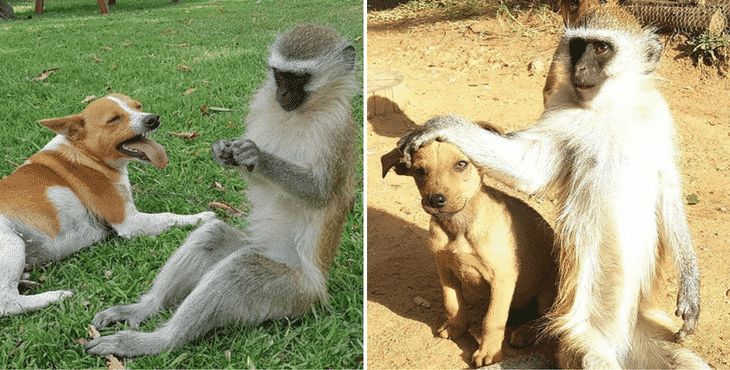 Then you should definitely check out this adorable rescued baby monkey who has befriended a lot of animals while living in an animal sanctuary. 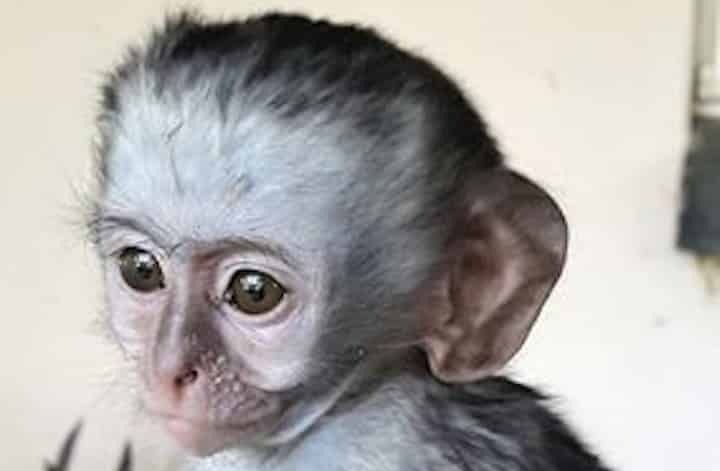 Horace, a vervet monkey, came at Zimbabwe’s Twala Trust Animal Sanctuary when he was only a baby. 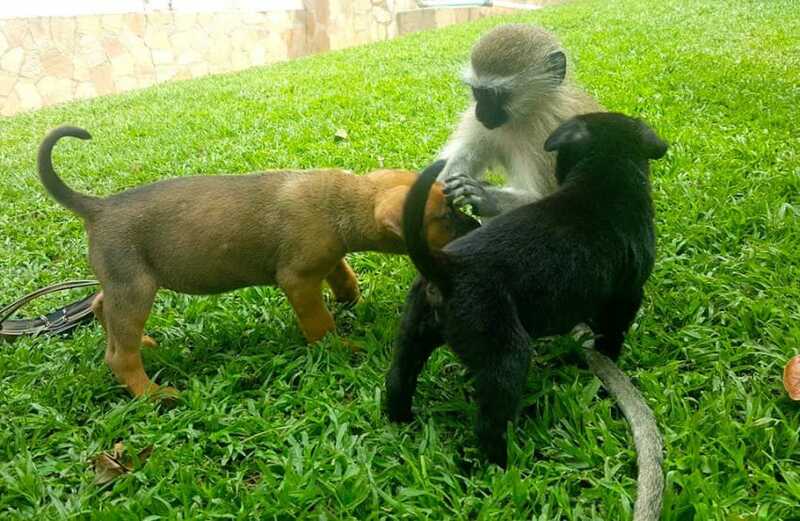 And he didn’t just settle to make monkey friends. 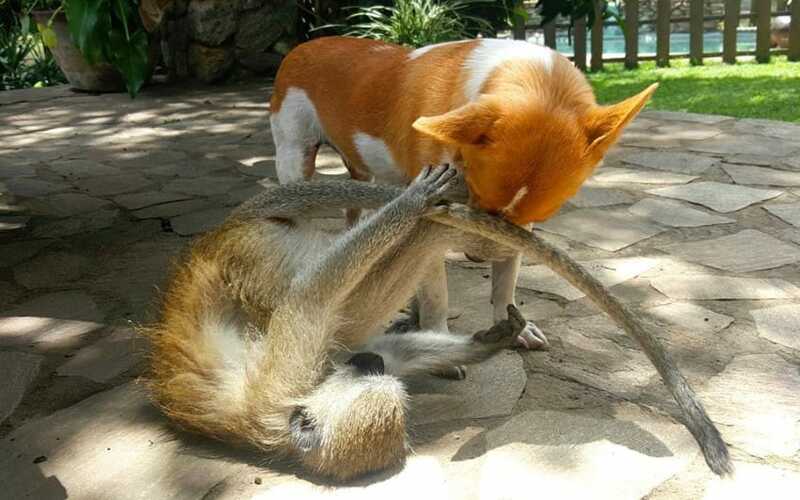 He has developed extraordinary friendships with all furry kinds, from kittens to dogs and deer. But his story began tragically, though. Horace’s mother has been hit by a car and so he became an orphan. He was terribly missing his mother and was very nervous when he got at the sanctuary. But remaining alone in the wild wasn’t an option since he was too small to be able to take care of himself. But rescue was on its way, and Horace’s life will soon change forever! At that age, Horace wouldn’t have made it on his own. But at the sanctuary, he received all the attention and love of both the staff and the domestic or wild animals. Horas was in for a treat! Our favorite photo of him is #8! Horace grew up and loved animals of all kinds. 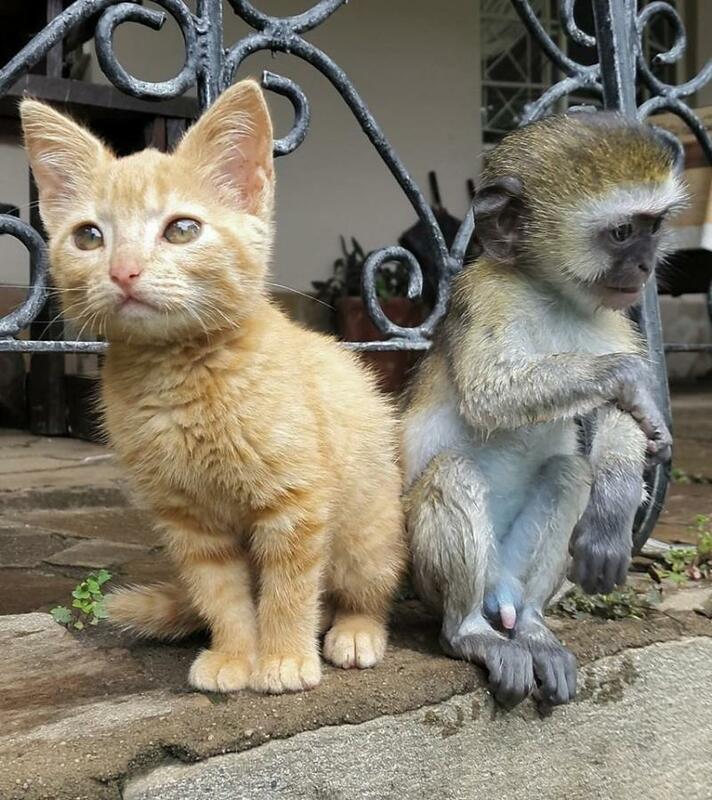 He liked to hang out with monkeys too, but he decided cats and dogs are way better. 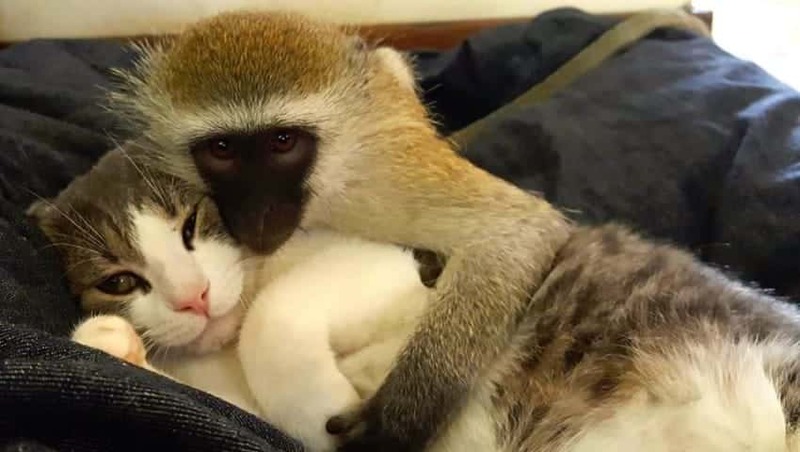 Prepare for over 10 photos of cuddles that will melt your heart! 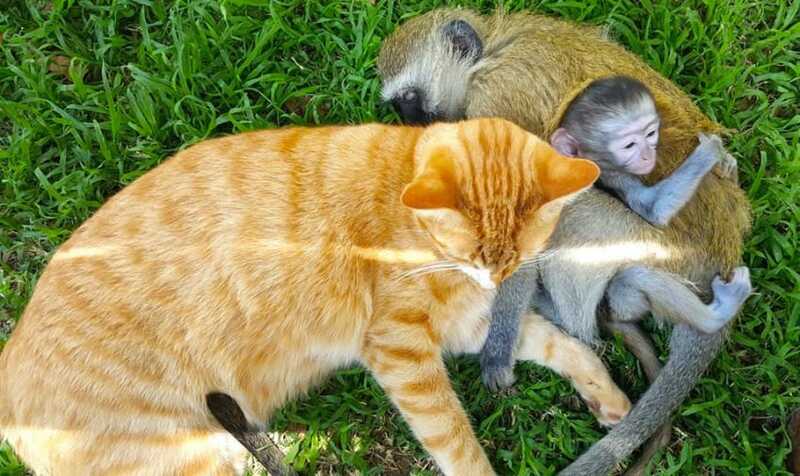 This is definitely the best place for an orphan animal, and Horace looks grateful for his new best friends. 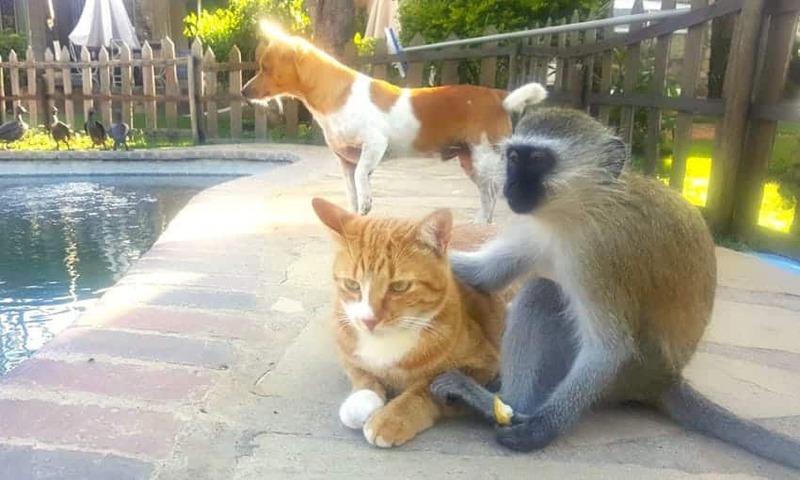 He even likes to take photos with his new best friends, and by seeing how photogenic he is, we’re not surprised that he even became an internet sensation. 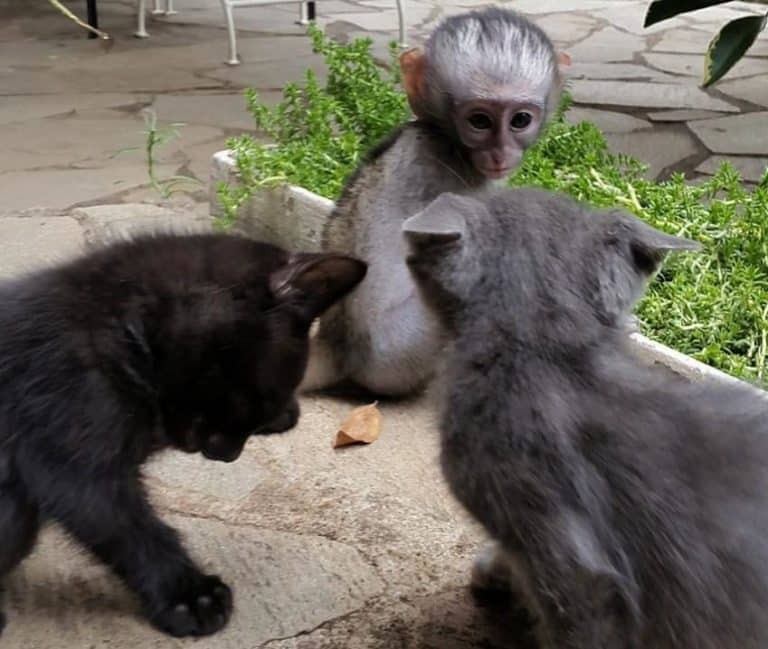 With time, the shy and tiny vervet monkey became friends with other animals in the sanctuary and even started playing with them. He liked to nap with cats and even sleep in people’s arms. See it for yourself in the next photos! The sanctuary didn’t have enough staff and animals had to be raised together. 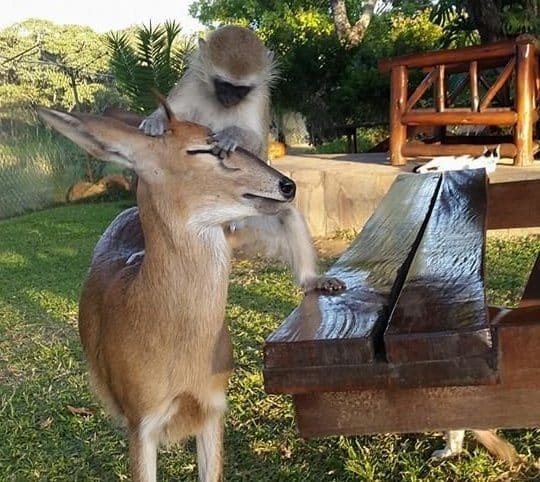 So, animals that wouldn’t have met in the wild, were being around each other in the sanctuary. Bonds were created, and we’re in awe! 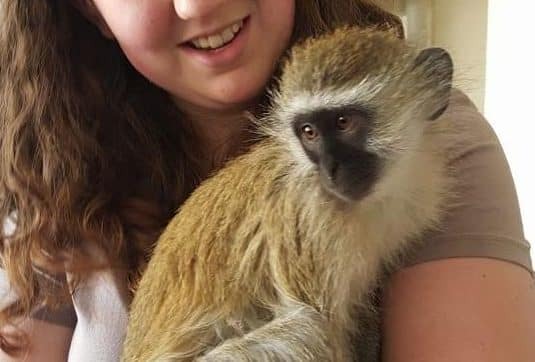 At the beginning, he might have been a bit nervous about the other animals, but he grew surrounded by them and began to love snuggling with felines or even riding dogs! See it for yourself at #6! Horace loves to spend time with his friends and cuddles them when they need it. And if he gets too tired, he gets a free ride and hangs out more with them. 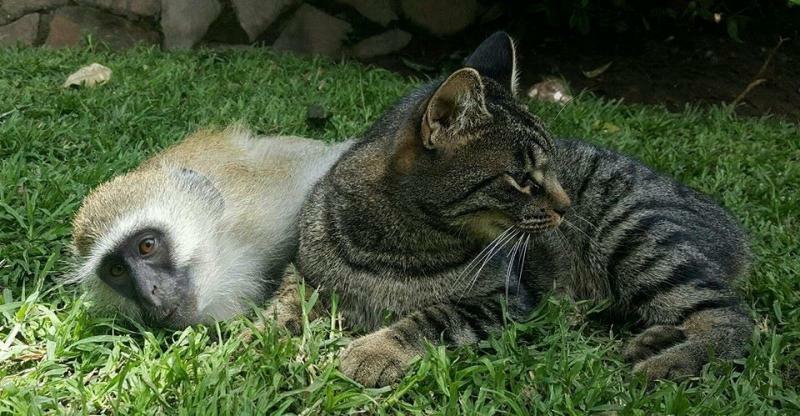 He also likes to spend time with other furry friends. Ready for more adorable photos? 10. Oh, Deer, You’re so Cute! Horace is very busy all day and when night comes, he’s not just going to get some rest. 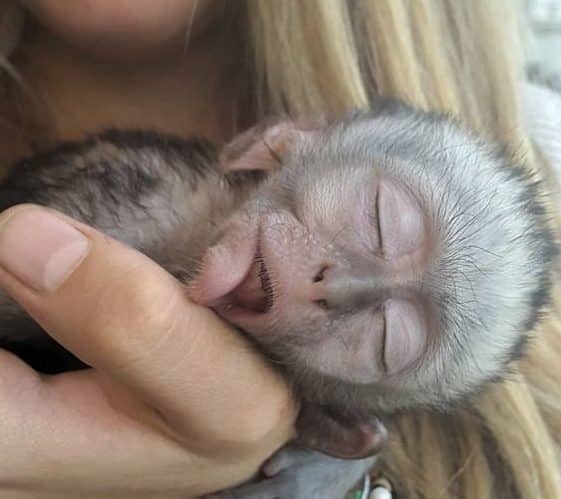 He’s out there, while other monkeys are asleep. He’s playing around the garden with the cats just so that he could go to nap with them in the middle of the day. Who wouldn’t want to cuddle Horace? 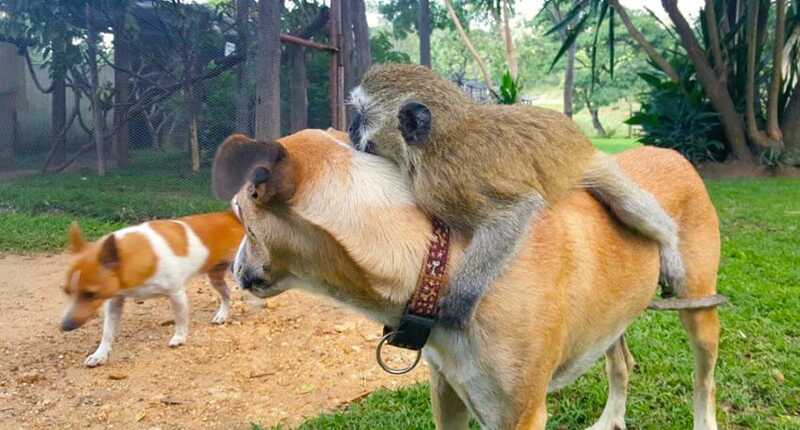 He’s a special monkey that loves to bond with anyone who’s willing to hug, play or run around the sanctuary. After so much time of playing and running around, Horace gets tired. 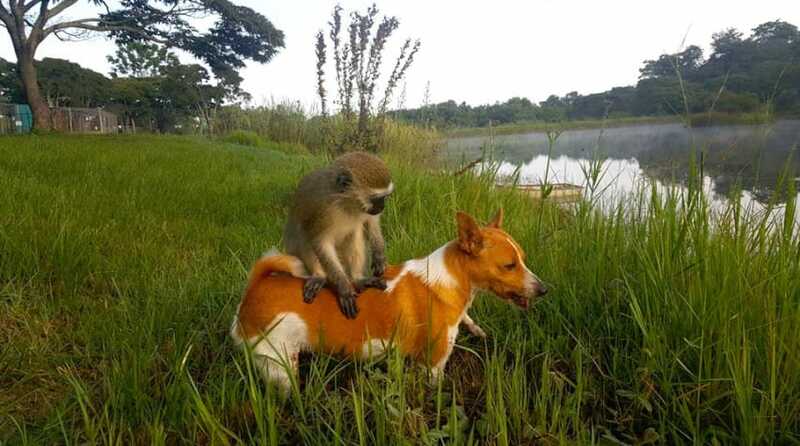 But his pals let him on their backs and gives him a ride. But cats are his favorite when it comes to nap time as you can see at #7 and #2. 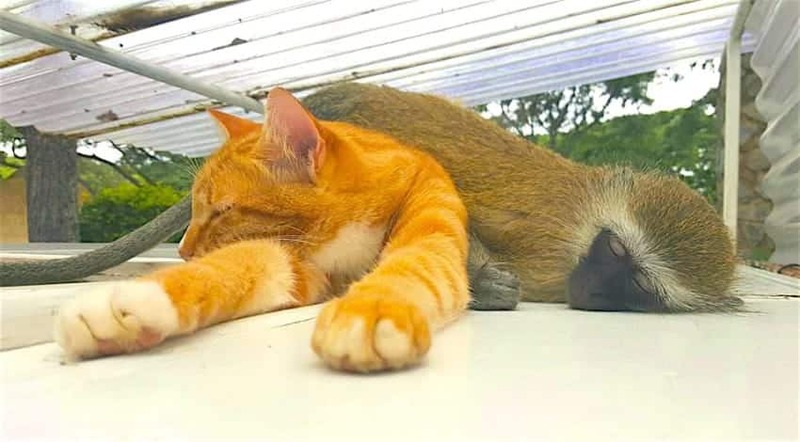 Sara Carter, the founder of the animal sanctuary Twala Trust Animal Sanctuary, said that Horace ‘runs around in the middle of the night, in the dark, with the cats’, but midday naps are a must when you hang out with felines. Horace likes to make all animals welcome at the sanctuary and it looks like they’re all having a blast. Sarah pointed out that Horace is such a character. 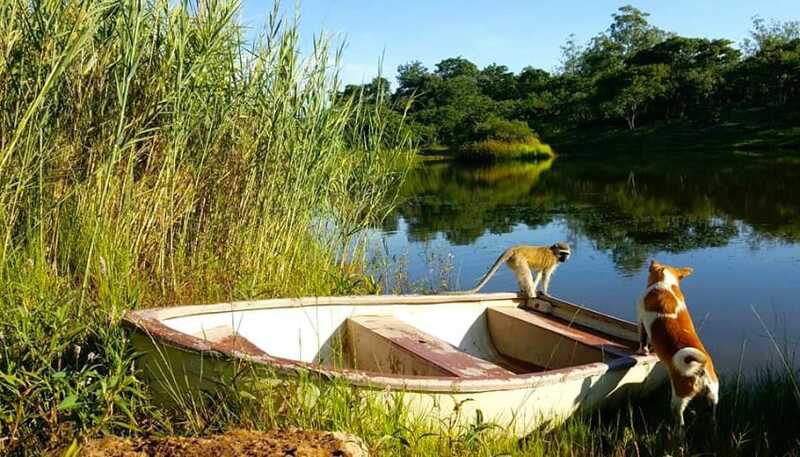 The vervet monkey enjoys every second of it! He’s also playing with dogs when he’s feeling frisky. And he’s the best at making other newcomers feel welcomed! 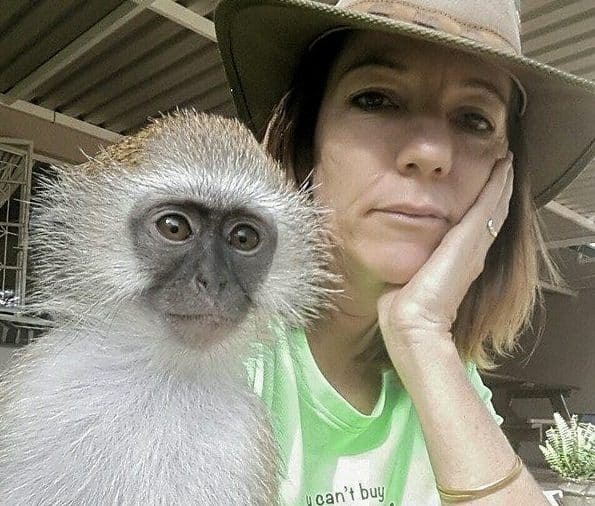 This vervet monkey is the best furry friend anyone could possibly have. 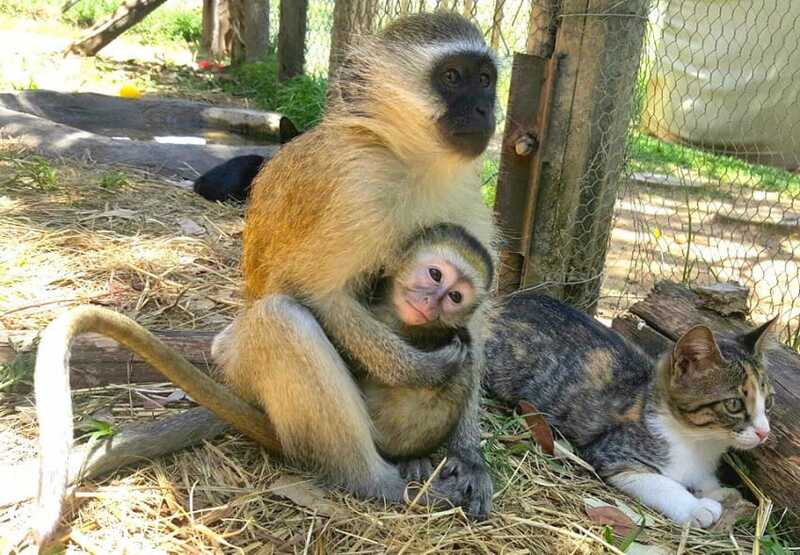 The sanctuary is heaven to all the orphans that needed help, and Horace is there to offer his companionship. We can’t take this much cuteness! Horace is set on giving every one of his friends a big hug. And when he’s done with this important task, he’s taking naps with the new kittens. 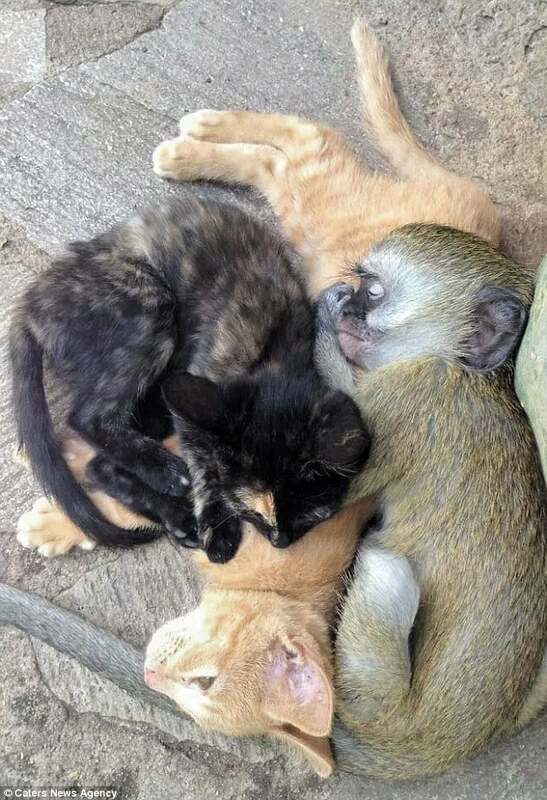 The little monkey grew up along his furry feline cats and puppy friends. He is now the one who welcomes all new animals to the sanctuary and takes his time to care for them. Who wouldn’t love to be Horace’s friend and just spend all day long at the sanctuary? His life sounds heavenly and we wish we were there with him, just hanging around. Meet Loki, The Meanest Looking Cat Ever!